Martin Barrett is a former school teacher of Ross’s, he was very supportive to Ross during his cancer battle and they both spent many hours sharing their passion for fly fishing. 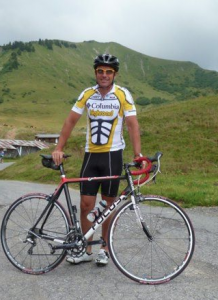 Martin is aiming to ride from ‘Land’s End to John O’Groats (approximately 900 miles) in 9 days to raise funds for the Ross Tomlinson Tribute Fund. 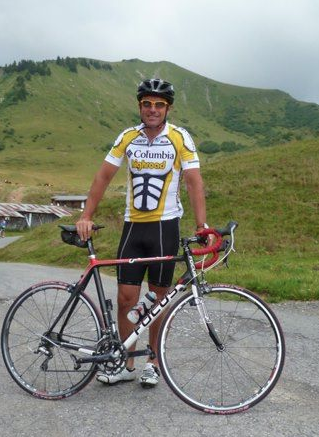 The ride will take place during May ‘Springbank’ week and will pass through Leyland on Tuesday 28th May. 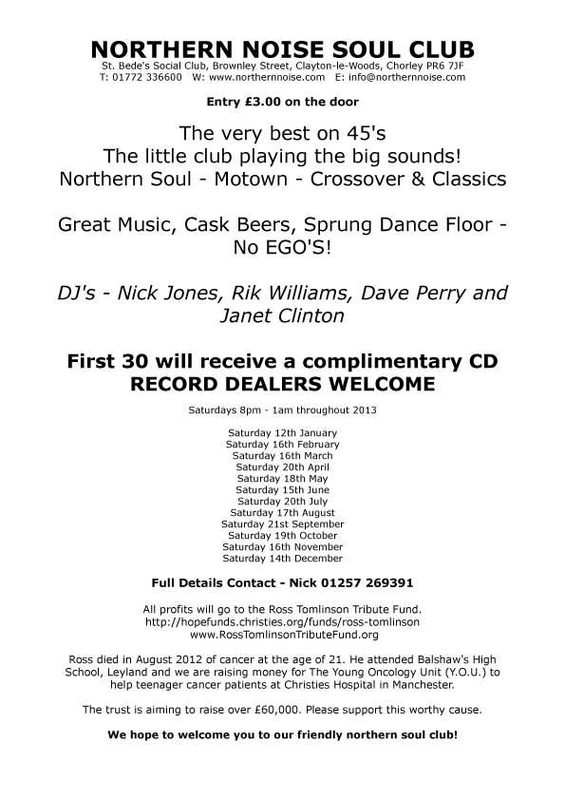 As many of you know it’s my 50th birthday very soon (the 18th of May) and I wanted to invite everyone to a party and I then I thought wouldn’t it be great if the party raised some money for two local charities. Our night is called “Dance for Derian House and Remember Ross”I know most people will be familiar with Derian House- the children’s hospice and it’s amazing work with children and their families but you may not know about Ross. 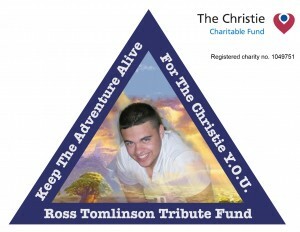 Ross Tomlinson was a young man who played in my son Yianni Hadjigeorgiou’s football team. I stood with Ross’s parents every Sunday watching our boys grow up and become young men. 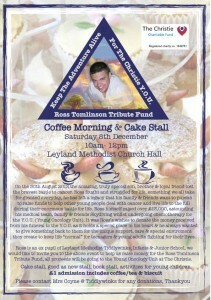 Very sadly last year at the age of 21 Ross died from a rare kind of cancer called Medullablastoma. Ross had started raising money for the Christie Young Oncology Unit in Manchester and now in his memory the Ross Tomlinson Tribute Fund continues to do so. 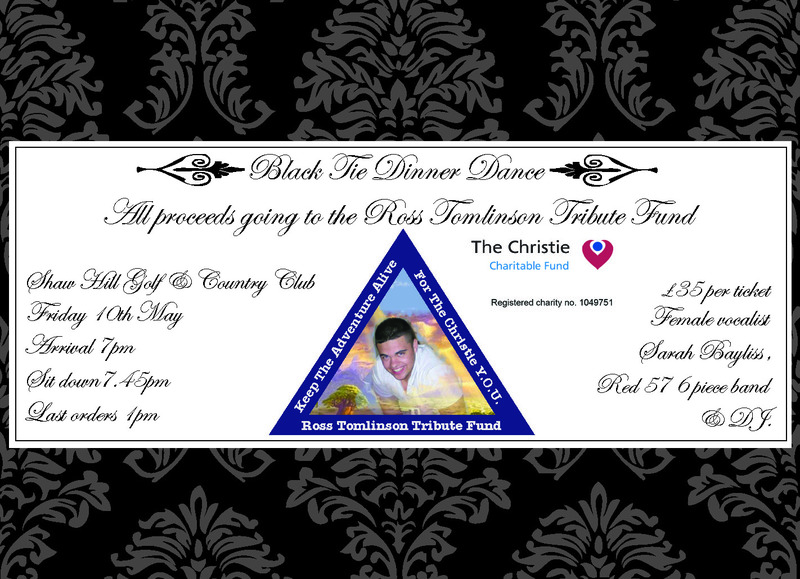 For every £5 you donate for the evening half will go to Derian House and half to the Ross Tom;linson Tribute Fund. Lots & lots of generous donations from friends and family events. Generous collecting tins from our community. 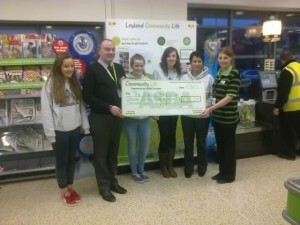 Tesco Easter Saturday Bag pack- Saturday 30th March- Tesco Extra Leyland Store. Ross’s mates are fantastic “bag packers” and are always ready for the opportunity to share with shoppers the legacy of the Ross Tomlinson Tribute Fund. 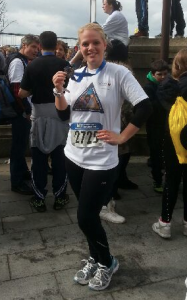 Kate a dear friend of Ross’s sister Samantha took part in the above event, and did really well and got a great time. 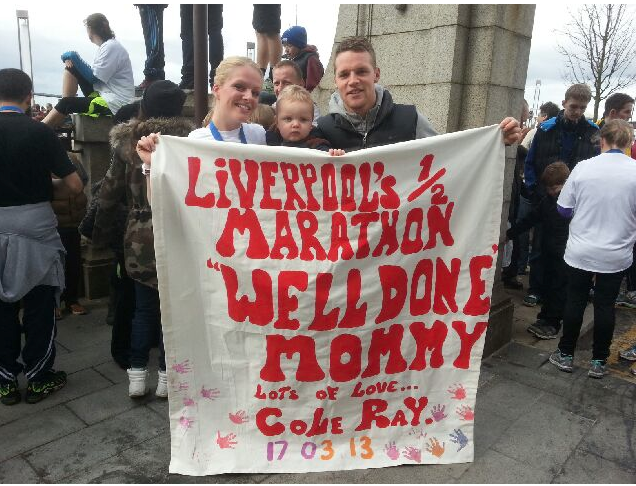 A massive thanks Kate! A private invite only party to raise money from the sale of cards made by the fabulous Pheonix Trading company, please click on the link below to take you through to the website were you can purchase online, please just add a note stating the order is in support of the Ross Tomlinson Tribute Fund. Huge thank you to Danny & Alison for donating the proceeds of the new year ticket sales to the the Fund. 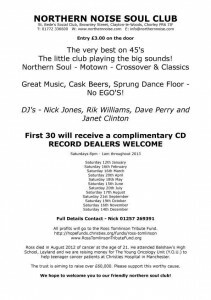 In addition thank you to the upstairs new years eve function for their contribution to this massive night of fundraising. 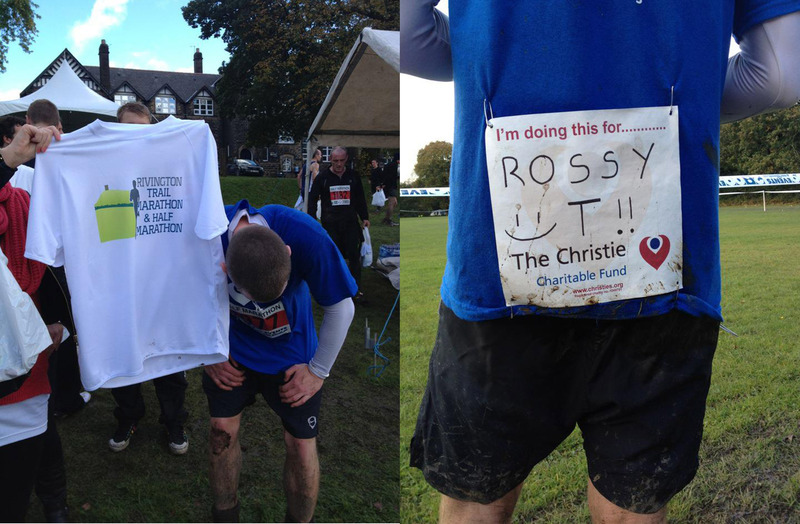 On 21st December 2012, the school held a non-uniform day in support of the Ross Tomlinson Tribute Fund. 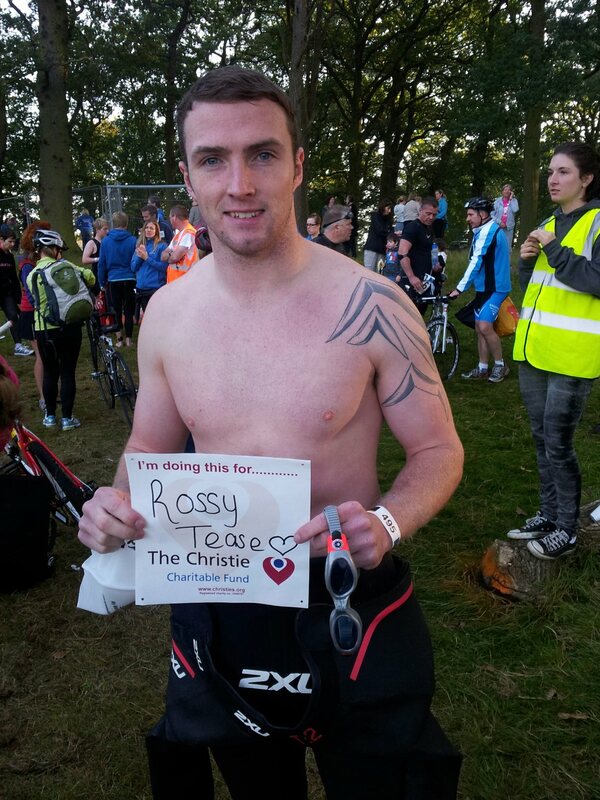 Ross was a pupil at Balshaw’s from 2002-2007 and a former pupil of Leyland Methodist School. Ross was not only a tremendous pupil but also a superb sportsman representing the school in football, rugby, athletics and basketball. He was also House Sports Captain for Farington. Triangle House Records are teaming up with a fantastic venue, The Adelphi in Preston, together hosting an eclectic charity music evening , where a range of fantastic artists and DJ teams will be showcasing their talents singing their hearts out in dedication to Ross who sadly lost his brave battle to cancer. 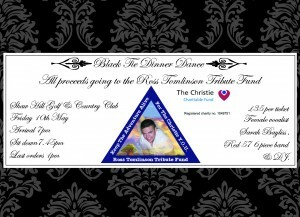 The event is a 100% for the Ross Tomlinson Tribute Fund with all proceeds donated to The Christie, Young Oncology Unit in memory of Ross. The event organisers and participants are passionate about this very worthy cause and want to raise as much money as possible and also raise awareness of the amazing work and unique environment the Y.O.U. creates to support teenagers and young adults battling for their lives. Thank you to everyone that supports our event. Marilyn and Sarah would like to thank everyone that supported the table top sale at Wellington Park on 18th November 2012. 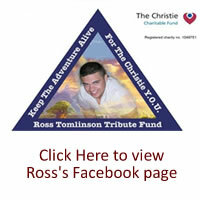 We raised £81.00 for the Ross Tomlinson Tribute Fund. Huge thank you to Ben for supporting the fund, raising an amazing amount!! A huge thank you to Mark for raising money for the fund by completing the gruelling Tatton park Triathlon.